For decades, consumers have had access to remote controls and home control panels to run an “automated” home. Remember X10? Unfortunately, simply connecting an appliance or device to the web so it can be controlled by a smartphone, tablet or laptop is not creating a smart device. That internet connection is essentially just a long-range remote control. A smart device needs to be smart. That means it needs to be intelligent — it needs to be able to learn and/or take independent action. So what is a smart home system? In some ways, it is like a smart butler. When a family hires a butler, they don’t need to teach him the basics of how a household works. It is the same for a smart home solution that includes integrated intelligence that can analyze data, learn from it and make decisions. First, a modern day smart home ecosystem is built around a system of sentrollers (sensors, actuators and controllers), a hub or gateway that transmits the data to and from the internet, as well as cloud-based intelligence to analyze and assess the data. The smart home system can also hook into various social media platforms such as Twitter and Facebook. Finally, as someone needs to handle the responsibilities of installation, maintenance and billing, there needs to be service provider component that enables a customer service interface and a billing system. 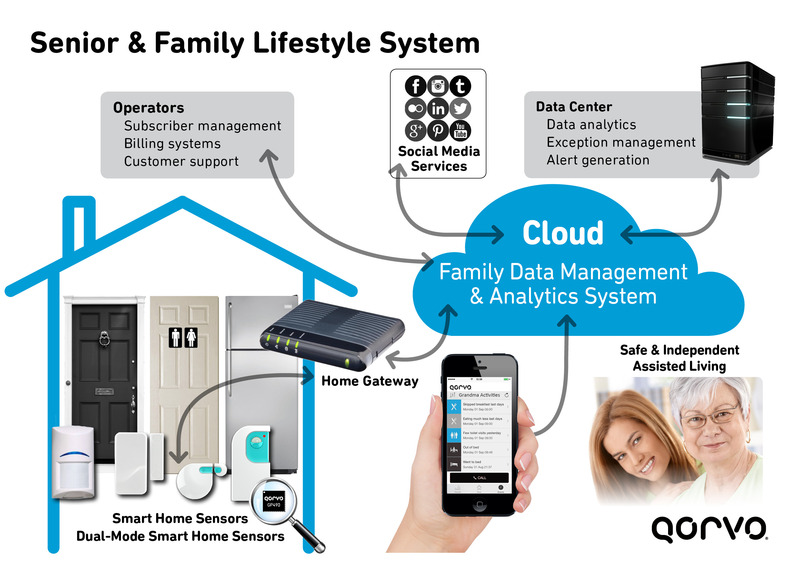 Smart home systems like ours consist of sensors connected to the cloud via a ZigBee home gateway which is then monitored and managed via smartphones, social media, service providers and cloud analytics and intelligence. Using a network more small sensors in the home, this system is able to securely monitor what is going on in the house — who is moving around, when and where. It then learns what normal behavior is. The data gathered from the sensors and transmitted to the cloud application via a home gateway is then analyzed and compared to the established baseline. When compared to a standard range of deviation, the system then judges if the resident’s activities fall within the range of normal. If not, the system alerts a caregiver or family member to take action. The beauty of this system is that it does not require cameras or microphones, so it is not an infringement on privacy. The system is also smart enough to recognize gradual changes over a longer period in time that indicate a possible medical problem is developing. Another advantage of this type of system is that the home gateway can be expanded into new applications such as security, lighting, home climate control, and power and energy management. A clever manufacturer can design products and devices that can link into this existing platform without having to spend excessive cycles on developing connectivity solutions, user interfaces, billing, etc. A smart home system is more than just a single connected device and its app. Manufacturers need to look at the big picture and see where they fit in within the ecosystem. There are many advantages to this system-level product design approach — developers do not need to be experts at all aspects of the solution. By understanding the smart home platform, they can develop solutions that fit into an already-in-place, successful solution. This enables those developers to do what they do best — develop devices and appliances that consumers actually want and need.